Happy Opening Day! We’ve seen: Buster Posey’s familiar flair for heroics; Jose Fernandez and Mike Trout picking up where they left off; close games all day and night; our first walk-offs thanks to an Alex Gonzalez single in the ninth for Detroit and then a 10th-inning homer by Neil Walker to provide the only run in Pittsburgh; the first time since 1953 Cincinnati was shut out at home on Opening Day; our first grand slam by Jimmy Rollins; the first overturned call due to Replay Review after a Fredi Gonzalez challenge; successful managerial debuts for Brad Ausmus and Matt Williams; big offense from the Giants and Mariners; Nyjer Morgan beating Oakland with his bat and glove; a great pitcher’s duel in Cincinnati, brilliant debuts with new clubs such as Nelson Cruz for Baltimore and Jose Abreu for the White Sox; our first run-scoring wild pitch; our first immediate comeback from 6-0 down; and of course first excessive use of ketchup and mustard on hot dogs. Here is an ongoing look from MLB.com’s Mark Newman at game-by-game firsts in today’s 13 openers . . .
WP: Hernandez. LP: Weaver. Hernandez is now 5-0 on Opening Day. First Mariners homer: Smoak, three-run shot in the ninth. Just learned about Don Baylor suffering a fractured femur while attempting to catch Vlad Guerrero’s ceremonial first pitch. Our thoughts are with Don. First Mariners lead: Almonte RBI double scores Zunino from third to give Seattle a 4-3 lead. It’s the third hit in a row. First Mariners triple: Mike Zunino. It scores Dustin Ackley and ties the score at 3-3. It also chases Weaver, who leaves with six hits allowed, three runs (two earned), three walks and six strikeouts. Meanwhile, King Felix has 11 Ks through 6 to pace the Majors on Opening Day. First Mariners run: Michael Saunders sac fly scores Justin Smoak in the second. 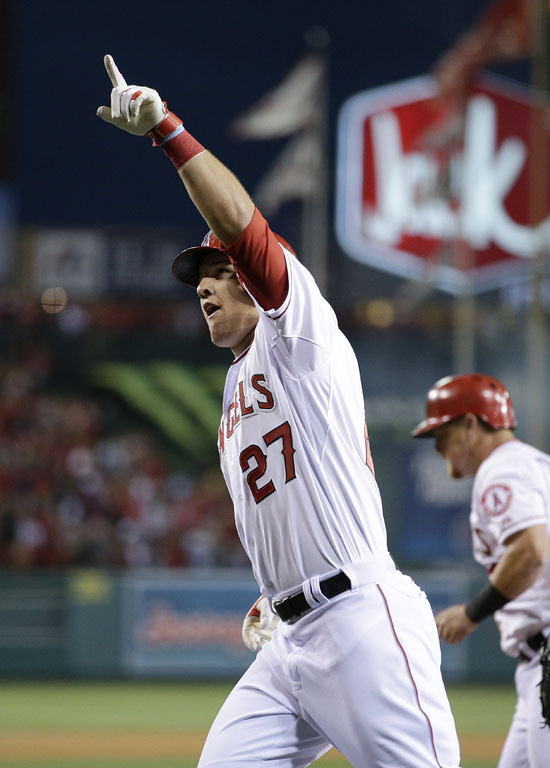 Angels, 2-1. First Mike Trout highlight: Breaking ball from King Felix and he crushes a no-doubter for a two-run homer. His second career HR off Hernandez. 2-0, Angels. First Angels hit: Kole Calhoun leadoff single in bottom of the first. First at-bat by Robinson Cano: Works the count full and then slashes a sharp grounder to short for the 6-3. “Did you see Robinson Cano run down the line?” Harold Reynolds said on MLB Network’s “MLB Tonight” show. First Mariners hit: Almonte singles to right on seventh pitch of that first at-bat. First pitch: Jered Weaver to Abraham Almonte, 10:13 p.m. ET, 85 mph fastball for called strike. WP: Cody Allen. LP: Johnson. S: John Axford. Tenth consecutive Opening Day loss for Oakland. Huge crowd in Oakland was not happy with their new closer’s debut, nor baserunning blunder when tagging at second was not the right decision and may have cost a big inning. First Indians run of 2014: Morgan sac fly off Jim Johnson scores Cabrera with the bases loaded in the ninth. First run of the game. Nick Swisher follows with Cleveland’s first RBI hit of the year, a broken-bat single up the middle making it 2-0. Masterson done after seven strong innings, allowing three hits and striking out four. First call to the bullpen by Oakland: Luke Gregerson replaces Gray (five hits, seven strikeouts, three walks) after six. First A’s walk: Eric Sogard to start the bottom of the sixth. First A’s hit of 2014: John Jason doubles to right on a 90 mph fastball from Justin Masterson in the second. First Indians hit: Asdrubal Cabrera singles with one out in the second. First pitch: Sonny Gray to Nyjer Morgan, 10:09 p.m. ET, 91 mph fastball low. It’s the first of four straight balls, so first walk for Indians. WP: Jean Machi. LP: Reed. S: Sergio Romo. First team to three losses: Arizona. The D-backs blow a 7-3 lead and start the season 0-3, including the two in Australia. First D-backs HR at Chase Field: Miguel Montero solo shot in the ninth cuts it to 9-8. Buster Posey first longball: Two-run shot off Addison Reed in top of ninth gives San Francisco a 9-7 lead. First Giants homer: Brandon Belt solo shot to start the sixth. First D-backs lead of the season: Gerardo Parra’s two-run single in the fourth gives Arizona a 2-1 lead. The D-backs never led in the two Australia games against LA. Aaron Hill’s two-run double breaks it open, 4-1 Arizona in the fourth. First Giants hit: Brandon Crawford leadoff single to left in the third. First Giants run: Crawford scores on Pagan single to right. First Chase Field at-bat for Mark Trumbo: Rips a single through the left side. Gives the fans a reason to cheer. First MLB pitcher to strike out side in the first in 2014: McCarthy. Pagan, Brandon Belt and Pablo Sandoval go down in order. First pitch: Brandon McCarthy 91 mph sinker to Angel Pagan for a called strike. It’s Arizona’s third game of the season, following the two losses to the Dodgers in the MLB Opening Series in Sydney. 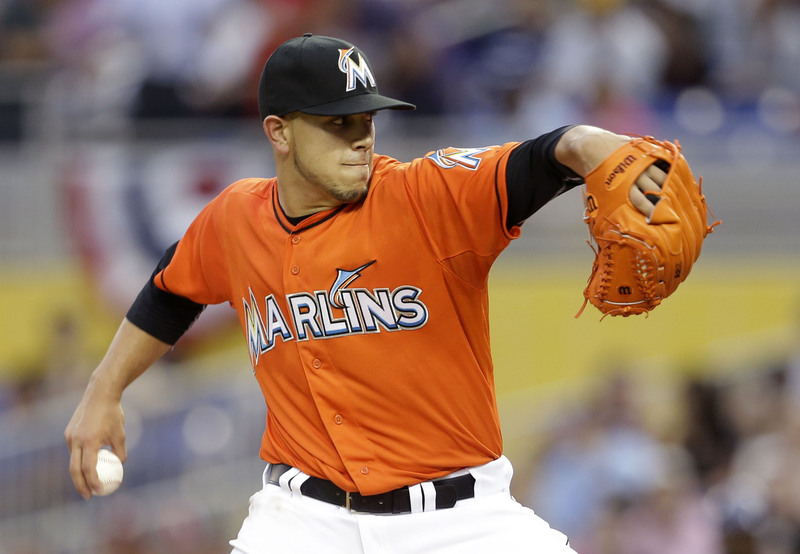 WP: Fernandez. LP: De La Rosa. First Rockies run: CarGo solo shot off Fernandez in the sixth, ending Fernandez’s shutout bid. It’s the last inning for the Marlins’ young ace, who finishes with nine strikeouts, matching the most by a Marlin on Opening Day. First Dan Marino appearance in the booth on MLB.TV: “With that energy, for the team around him, that’s important because it could rub off,” Marino says of Fernandez. First Marlins home run: Marcell Ozuna starts the scoring with a solo shot in the third, inside the left field foul pole on a 92 mph fastball from Rockies starter Jorge De La Rosa. First time Fernandez strikes out the side: Third inning. That makes it six K’s in three innings. First Rockies hit: Michael Cuddyer bounces a single up the middle off Fernandez in the first. CarGo immediately follows with a single This will not be the second consecutive no-hitter at Marlins Park, dating back to the last game of the 2013 regular season. First time Fernandez’s grandmother has seen him pitch since he was a boy in Cuba. It was a surprise. “This is the biggest thing in the world to be able to see him pitch,” she said before the game. First pitch: Jose Fernandez to Charlie Blackmon, 96 mph fastball inside for ball, 7:13 p.m. ET. WP: David Price. LP: R.A. Dickey. First Blue Jays scoring: Eric Kratz 2-run pinch-homer in the eighth, breaking up David Price’s shutout. First Blue Jays hit: Maicer Izturis singles to left in the third. First Rays run: Evan Longoria singles to center to score Myers in the first. 1-0 Rays. First Rays hit: One-out double by Wil Myers in the first. First pitch: David Price to Jose Reyes, called strike. WP: Wainwright. LP: Cueto. S: Rosenthal. First two-error inning: Cardinals, bottom of the eighth. Cincinnati fails to take advantage of silver plate. Still 1-0. First four-strikeout day: Wainwright whiffs Hamilton for the fourth time in as many at-bats. 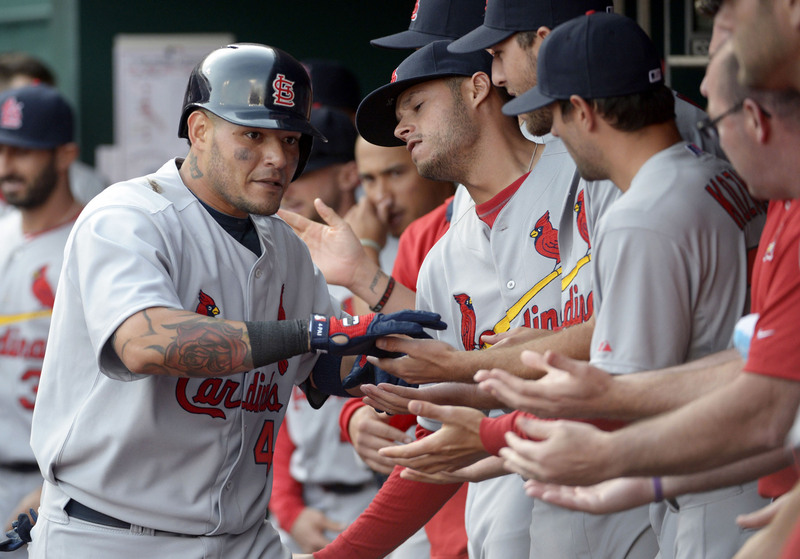 First Cardinals run: Yadier Molina solo homer on 88 mph cutter from Cueto with one out in the seventh. 1-0, Cardinals. First Cardinals hit: Matt Adams singles to left on his third pitch from Cueto. First Reds hit: Brandon Phillips rips single to right on 89 mph cutter from Wainwright in the first. First Adam Wainwright strikeout: First opposing hitter, Billy Hamilton. First pitch: Johnny Cueto 92 mph fastball to Matt Carpenter, called strike. WP: Sale. LP: Nolasco. S: Lindstrom. MLB’s first multi-homer performance: De Aza goes deep a second time. First Twins scoring: Kurt Suzuki two-run single in top of third ties it at 2-2, before Chicago adds three more runs. First White Sox scoring: Alejandro De Aza two-run homer on an 87 mph Nolasco slider brings in Jose Abreu and makes it 2-0 in the second. First Twins hit: Chris Colabello singles to left off Sale in the second. First White Sox hit: Adam Eaton singles to center off Ricky Nolasco in the first at-bat of the White Sox season. First pitch: Chris Sale 94 mph fastball to Brian Dozier for a ball. WP: Britton. LP: Lester. S: Hunter. First Orioles homer: Nelson Cruz takes Lester deep on the first pitch after the seventh-inning stretch at Camden Yards, the decisive blow. First shouts of glee by fantasy owners who picked Sizemore: Leadoff homer in the fourth, making him 2-for-2. Game tied at 1-1. First Orioles run of 2014: Nelson Cruz scores when Delmon Young grounds into a 4-3-6 double play in the second. Baltimore, 1-0. Grady Sizemore’s first AB with Boston: sharp single to right in the second. First hit by Orioles: J.J. Hardy single off Jon Lester in the first. First hit by Dustin Pedroia: Single on a Tillman knuckle-curve. It marks eight straight openers in which Pedroia has hit safely. He is the only Red Sox player in the last century to do that. First example of Red Sox picking up where they left off: Nava fouls off three straight pitches in a seven-pitch AT for club that had the longest at-bats of 2013. This one ends with a comebacker to the pitcher. First pitch: Chris Tillman 89 mph fastball to Daniel Nava for called strike. WP: Gallardo. LP: Teheran. S: Francisco Rodriguez (1st of season, 305th of career). First Milwaukee run of 2014: Aramis Ramirez two-run double in the fourth. First roar at Miller Park: Standing ovation for Ryan Braun as he steps to the plate. First Braun at-bat, fly to left. First Brewers hit: Carlos Gomez single in the first. First Braves hit of 2014: Heyward in leadoff at-bat, single on third pitch. First pitch: Yovani Gallardo 91 mph fastball for a ball to Jason Heyward. Bud Selig takes in his last opener as Commissioner. WP: Lee. LP: Figueroa. Lee won despite giving up eighth earned runs. His ERA was 21.00 after three, but it dropped to 14.40 by the end of the day. It’s a reminder that you never stop pitching, because some days your hitters have your back. First MLB teams to score in double figures this season: Both of these. They also combined for 31 hits. First slugfest: Braves overcome a 6-0 deficit to take a 7-6 lead after three. First Rangers run: Leonys Martin singles in Adrian Beltre. Josh Wilson follows with a bases-clearing double, quickly slicing Philly’s lead to 6-4. First Phillies run: Cody Asche doubles in Howard in the second. First Phillies baserunner: Ryan Howard takes a 95 mph fastball from Scheppers on full count for a walk in the second. Prince Fielder’s first at-bat as a Ranger: Three-hopper to Chase Utley for a 4-3, on a 92 mph fastball from Cliff Lee. First pitch: Tanner Scheppers to Ben Revere, 94 mph fastball for ball one. First pitcher since 1981 to make his first MLB start on Opening Day. WP: Joe Nathan. LP: Wade Davis. First MLB RBI triple: Alex Gonzalez brings home Jackson with tying run. It’s 3-3. Both starters are out of the game with NDs. First MLB run scored on a wild pitch: Aaron Crow WP and Austin Jackson scores. First Royals run of 2014: Salvador Perez doubles on a 94 mph fastball from Verlander in the fourth, bringing Alex Gordon around and tying the score at 1-1. Watch it here. 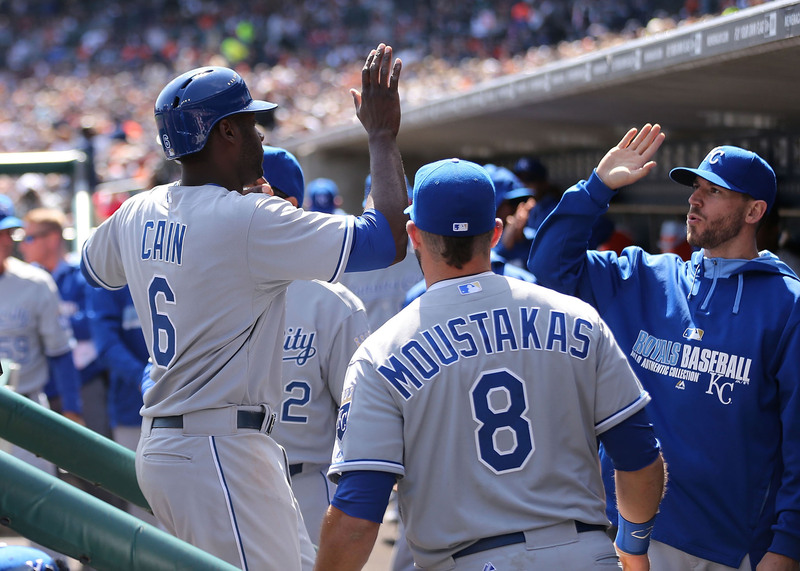 Then it’s the first Royals lead of 2014, as Lorenzo Cain singles to score Perez. Verlander allows one more run and leaves ’em loaded, 3-1 after the top of the fourth. First Tigers homer of 2014: Victor Martinez on 87 mph cutter from Shields in bottom of the second. 1-0 Tigers. Ian Kinsler’s first at-bat in a Tiger uniform: Fly to center on sixth pitch from James Shields in first. First pitch: Justin Verlander 92 mph called strike to Nori Aoki. The first at-bat is a 6-3 groundout, and so is the next one for Omar Infante. First hit by Kansas City: Eric Hosmer double off Verlander on sixth pitch in the first. First 3-strikeout day by Curtis Granderson: Immediately. Whiffed with two out in the 10th after a David Wright two-run homer. First blown save: Bobby Parnell. Nationals tie it at 5-5 in top of the ninth. They proceed to add four more in the 10th. First Nationals home run: Adam LaRoche takes Gee deep to center. “Adam Dunn-like bomb,” Darling says. This one’s also down the pipe, just like Strasburg’s pitch to Brown. “You don’t do that to the big boys,” Keith Hernandez says. It cuts New York’s lead to 3-2 in the top of the second. First Mets home run: Andrew Brown, three-run shot in first inning off Strasburg, his first at-bat of the season. Strasburg grooved it. First RBI opportunity for Curtis Granderson, called strike three on 94 mph fastball from Strasburg in first. First Mets hit of 2014: Juan Lagares single off Stephen Strasburg in the first. First hit on East Coast in 2014: Ryan Zimmerman singles on another fastball from Gee. 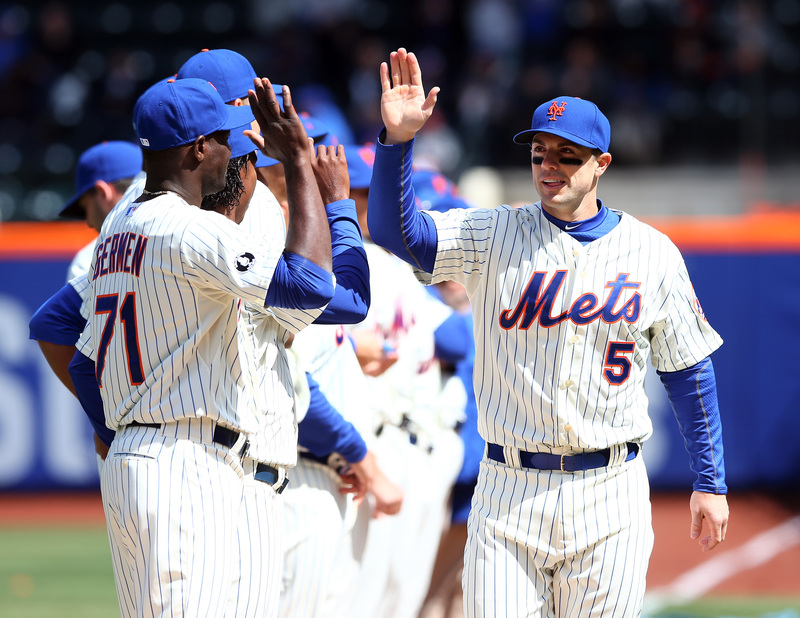 Dillon Gee makes first Opening Day start and opens with an 87 mph ball one to Denard Span. Gee is coming straight out of the gate throwing fastballs, analyst Ron Darling says on MLB.TV, via SNY. Five straight fastballs. First mayor to throw first pitch: Bill DeBlasio, big righty, up and in at Citi Field. His first term as mayor of America’s largest city and his first such opportunity. First and possibly longest rundown of the season: Bonifacio out at home on Starlin Castro fielder’s choice in eighth. First of 19 meetings between these clubs. Pirates went 12-7 in the series last year. First Pirates extra-base hit: Starling Marte double off Samardzija in bottom of the sixth. But it ends in a double play, still scoreless. It’s 57 degrees at PNC Park. Not bad. The smell of grills and food on the concourse: amazing. Starting pitchers dominating this game so far. Fastballs and cutters galore from Samardzija, not many sinkers. First bunt into double play: Samardzija 1-5-4 after Cubs had men on first and second to rally. First hit by a reigning Most Valuable Player: Andrew McCutchen singles in first at-bat. First Cubs hit of 2014: Bonifacio leadoff single in first at-bat of team’s season. First pitch: Francisco Liriano 91 mph fastball to Emilio Bonifacio, called strike.